WINNING WITH FROZEN TREATS: Where does a 600-pound gorilla sit? Well, the creator of frozen cookie dough and premium ice-cream sandwiches is sitting firmly atop the awards heap. 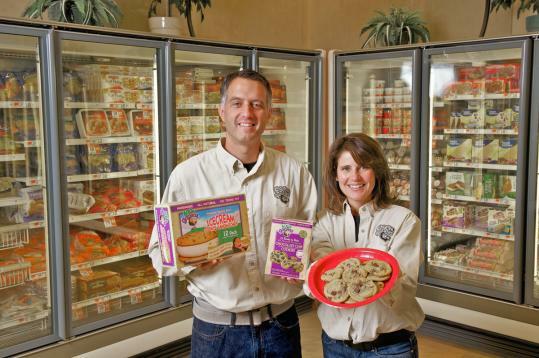 Paula White of Duxbury, co-founder with her husband, Chris, of 600lb Gorillas Inc., maker of those frozen treats, was named the 2012 Massachusetts Small Business Person of the Year by the Small Business Administration. The couple will attend an administration event at Fenway Park June 6, where awards will be conferred. The company was nominated by South Shore Savings Bank vice president John Mannion. The Whites were engineers when they began kicking around ideas for their own company, which they founded in 1999. She said the firm’s success, and the Small Business award, is a tribute to major grocery chains that took a chance on a little company. The product has sold in Stop & Shop since day one, she said. It’s also available in Roche Bros., Costco (including some in California and Hawaii), and BJ’s Wholesale Clubs. The Whites’ company is truly small - just the two of them. They subcontract the making of the products, which follows their own recipes, to firms in the Midwest. So far, the firm churns out just the two products, frozen chocolate chip cookie dough and ice cream sandwiches, but the Whites are engineering more, they said, including new flavors for the sandwich, and new types of frozen cookie dough. They tout the products as all-natural, and using real butter, a fattening quality a 600-pound gorilla might appreciate. For more information on the product, and where it’s available, visit www.600lbgorillas.com. CARVER ARTIST HONORED: Jacquie Gouveia (inset) of Carver was named to the list of the Top 50 Emerging Artists by the New York-based magazine Art Business News. The article about the winners runs in the March/April issue. To see her work, visit www.jgouveia.com. BUSINESS BRIEFS: Priscilla Beadle of Hull has opened Bead Jewelry and Home Décor Arts, 316 Washington St., Norwell, selling original jewelry and works of art. Beadle, doing business as Beadleful, moved last year to the area from California. She has been a bead artist since 1993, she said, when after 23 years in the corporate world, she retired to join her husband on his career in Hong Kong. She said Southeast Asia inspired her to hunt for beads and create jewelry. For more information on Beadle and her work, visit www.beadleful.com. Kevin McAnneny of Hingham was named director of political and community affairs at the Utility Workers Union of American Local 369. He serves as a community liaison, working with communities to organize events, such as Thanksgiving and Christmas meals. The local last year delivered meals to more than 400 families. Hope Aubin of Wareham finished second in the annual speech contest of the Marion Toastmaster’s Club, with a speech, “Death of a Spider,’’ about how books can impact someone’s life. First place went to Maryann Murphy of Mashpee with “Push-Pull,’’ about improvement through motivating oneself to take on new challenges. Murphy is president of the Marion Toastmasters Club, which is open to new members and meets at 7 Barnabas Road, Marion, the first and third Thursdays of the month. For information, visit 1174738.toastmastersclubs.org or call 508-292-6706. Wayne and Michelle Southworth of Hingham, owners of MWI Enterprises Inc./Fiber-Shield of Boston, were named as one of the 2012 honorees of the Excellence in Design Awards given by the New England chapter of the American Society of Interior Designers, at the society’s recent gala in Boston. The Southworths founded their company, a fabric and custom carpet-care firm, in 1989. The society’s New England chapter is the oldest and largest professional group for interior designers, with more than 20,000 members.